We are less than 5 minutes from town and buses for Edinburgh and the Scottish Borders pass our driveway at regular intervals throughout the day. Ideally located near to Glentress Mountain Biking Trail Centre as well as the World Class Innerleithen Down hill Trails. Visit Scotland have graded our Guest house with a fantastic 4 GOLD Star award & our Courtyard Cottages with a highly commended 4 Star Visit Scotland grading. We are very proud of our achievements here at Winkston. So when you are looking for a holiday home in Peebles, you need look no further than us. 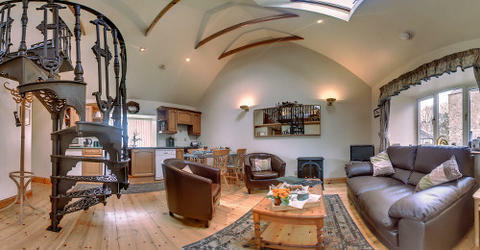 Take a look around our holiday accommodation with our new interactive virtual tours. Click each image to open a new window and explore! A warm welcome from Jan and a recommend for a good local Italian restaurant. The room was very good size including small sofa and armchair and good en-suite shower and very comfortable bed. Excellent breakfasts. We stayed with Winkston Farmhouse in the Ploughman’s Rest self catering cottage for a family holiday & biking at the 7Stanes projects. I cannot fault the hospitality, helpfullness & level of detail provied by all the family. Spacious comfortable rooms in a beautiful old farmhouse. Look out the windows and watch the sheep and cattle. I would not hesitate to recommend this bed and breakfast. Jan, the hostess, of this guest house is an incredibly thoughtful lady and you will want for nothing. Rooms are beautifully furnished and spotless. Excellent value for money and her customer service is second to none. Jan went out of her way to make sure my stay was peaceful and relaxing. A beautiful cottage, sparkling clean, well equipped and extremely comfortable. I asked for peace and quiet and could not have found better. The situation is lovely and the surrounding countryside is delightful. A perfect stay.